Fall is officially here! With the season’s change come shorter days, and longer nights. As the weather cools and the sun rarely makes her appearance, what a perfect time for inner reflection and a focus on gratitude. It has been an honor and privilege to open my own practice here in Seattle. The doors have officially been open for one month and I cannot begin to express the amount of gratitude I have for the patients I have seen so far. Leaving the corporate world of medicine has allowed me the time to cultivate what I would really like to bring to health care in our great city. I want to focus on a sense of community and compassion for one another. My goal is for any patient who walks into my office to feel safe, supported and have their concerns validated. Stache Bash is the perfect first event at my office. I see this event not only as an open house to the community to come check out the location, but also as a statement that I want men to have a place to come and feel supported in their quest to look and feel their best. No Shave November was launched to bring awareness to men’s health and prostate cancer. It has since grown into a large community of men and women who forego their normal grooming expenses for the month and donate those funds to cancer research. 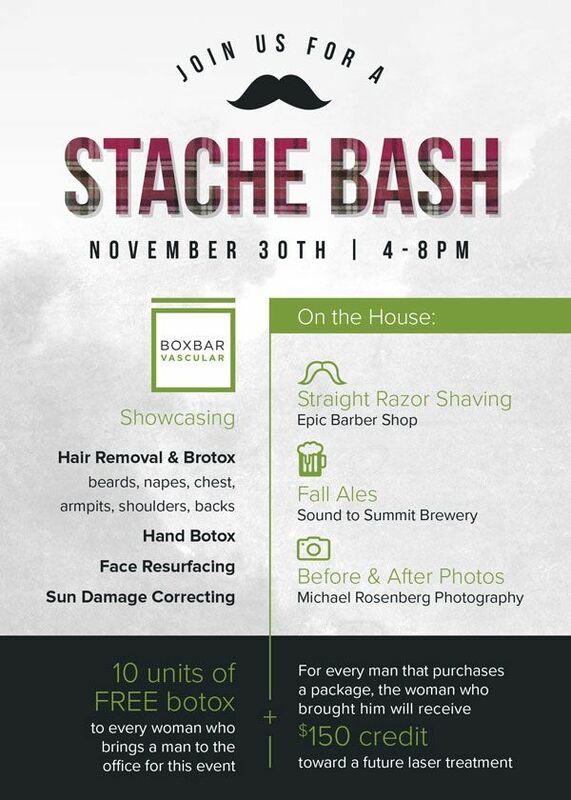 Stache Bash takes place on November 30th from 4:00-8:00 pm. Come and experience an impeccable straight razor shave provided by our neighbor, Epic Barber Shop. Taste incredible local ales from Sound to Summit Brewery, and have fun in the photo booth by Michael Rosenberg Photography, all on the house. Curious about Brotox? Ever wanted to have that neck beard gone for good? Tired of varicose veins limiting your physical activity? I can’t wait to show you what we can do to help you look and feel your absolute best! 10% of any packages sold will be donated to fight testicular cancer. For more information check out the event on my Facebook page. I truly hope to see you there.